Under Saxon rule, the sheriff’s duties were extensive and included not only apprehending offenders, but jailing them, summoning a jury, and trying the offenders as well. He also had the authority to mobilize the entire civil force of the shire in cases of emergency. The Norman invasion and conquest of 1066 A.D. sparked changes and reforms that marked the beginning of what is now known as the Common Law Legal System. Under Norman rule, the sheriff’s responsibility was modified in that he no longer tried cases. Instead, a court system was established and the sheriff developed into an executive arm of the courts, carrying out writs, apprehending offenders, maintaining jail facilities, and punishing guilty persons as directed by the courts. Since the legal system in the United States developed along English common law lines, it maintained the position of sheriff and the traditions that accompany that position. These traditions allow the office of the sheriff to occupy a unique place in the justice system – serving civil process, maintaining jail facilities, and law enforcement. Furthermore, in parts of the country, including New York State, the sheriff is still considered the chief law enforcement official within a county. By an act of Congress on the 16th of September 1776, provisions were made for bounties to be offered to the soldiers enlisting in the Continental Army during the war. One of these provisions would eventually include the pension provision of free land in an area of more than 1.5 million acres in central New York that would become known as the Military Tract. The Military Tract witnessed the region’s first sheriff, a veteran of the American Revolution, Col. William Colbraith. Little is known of Col. Colbraith, yet early references refer to him being an Irishman with a capacious soul and genuine good humor. Onondaga County is formed on March 5th, 1794. It becomes the 21st county in New York State and was comprised of 1.75 million acres (what is now all of Onondaga, Cortland, Cayuga and Seneca counties, and parts of Oswego, Tompkins, Schuyler, Yates, Tioga, and Herkimer counties). There was a population of 2000 settlers (many were veterans of the Revolutionary War) along with two Iroquois nations – Onondaga and Cayuga. The County Sheriff’s Office was also formed on March 5th. The Sheriff was an appointed post, appointed by the Governor, and an oath of office was required. Terms of office were limited to a single four-year term; they could not hold office for a consecutive term. Sheriffs were paid by a fee system for services rendered – serving civil process, transporting prisoners, and making arrests. The first recorded arrest was James Fitzgerald for assault and battery and attempted robbery. The Sheriff was paid 32 pounds and 11 shillings for the arrest. Construction begins on the Onondaga Hill Jail. (The jail would not be completed until 1810. Prior to this jail, prisoners were transported to jails in Herkimer, Rome, or Whitesboro, New York) The first floor served as the jail and apartment for the Jailer and the second floor served as the courthouse. The jail cells and doors were constructed of heavy oak planks with wrought iron spikes. The cell doors had a diamond-shaped hole through which the prisoners received light and food. Criminals and Debtors were housed in the jail. The Sheriff and/or his deputies were responsible for paying the debts of escapees. Irons were authorized for felons in order to hamper escapes. If a prisoner was killed in an attempted escape, it was considered justifiable homicide. If a prisoner killed another person during an escape, it was considered willful murder. James Beebe was the county’s first “Jailer”. In 1812, at age 60, Beebe was also custodian of the arsenal located on Onondaga Hill. (This duty did not appear to be related to his duties with the Sheriff’s Office.) In September of 1812, it became necessary for him to make a trip to Oswego in regards to his official capacity as Custodian of the arsenal. (These duties most likely relate to activity at Fort Ontario.) On September 20th, while he was returning from Oswego, Beebe drowned by accident in the Seneca River. During his funeral, several debtors escaped from the jail (the first recorded jail break). Beebe’s heirs paid the outstanding debts. The first constables were appointed to the Village of Syracuse. A new jail replaces the Onondaga Hill Jail. The new jail is located in the Village of Syracuse at the corner of Ash St. and Salina St. The jail is constructed of stone. A new courthouse was also constructed across the street. The first legal execution is conducted at the Salina St. jail on November 19th. Sheriff Elihu Phillips executes by hanging Zachariah Freeman, Jr. for the murder of Freeman’s common law wife, Sara Boyd. The execution took place in an enclosed yard of the jail. It was reported that a large crowd had gathered for the execution and that it was with difficulty that the crowd was kept from breaking down the fence and entering the yard. The Sheriff’s Office becomes an elected post. Salaries are established for the Sheriff. Deputies were paid by the Sheriff (money generated through civil process). It remains illegal for a sheriff to hold two consecutive terms of office. The County Board of Supervisors adopted a plan for a county penitentiary to be built on the city’s North side. (Syracuse was incorporated as a city in 1848.) The Board passed several acts in 1851 that directly affected the Sheriff’s role as “Jailer”. The penitentiary served a dual role as a penitentiary and jail. All prisoners confined within the facility were under the control of one principle keeper or Superintendent. The Sheriff no longer carried the responsibility for maintaining the jail. The County Board of Supervisors adopted a plan to build a new penitentiary at Jamesville (1901-1983). On March 10, 1898 the State Governor signed the bill authorizing the removal of the North side penitentiary to the new site. The State Commissioners urged haste in building the new prison, as the needs were great. In 1901, the first prisoner was moved into the new Jamesville facility. The facility would maintain a dual role as a penitentiary and jail facility. The position of Onondaga County Sheriff Deputy becomes a salaried position. About this time, the Cedar Street jail is opened and the Sheriff reassumes the role of Jailer. The first recorded Matron position (female deputy) received a recorded $300 annual salary. Sheriff Lewis Schriber forms the first complete organization of women deputy sheriffs, “Women Sheriff Corps.”. Each town was represented by one of the deputies who assisted in the courts and worked as juvenile officers. The Onondaga County Sheriff’s Office forms its first uniformed patrol. The Sheriff’s Office motorized patrols are equipped with “one-way” radios. Police/Fire call boxes are utilized around the county. It became legal for a sheriff to be elected for successive terms. The Cedar Street jail is renovated. Despite delays over labor union disputes, the jail cells are replaced with escape-proof cells equipped with electronically controlled locks. A 1939 prisoner escape led to the fatal shooting of an inmate. The Jamesville Penitentiary is closed due to a fire. In January, the Sheriff’s Office adopts military titles for rank. Prior to this, ranks were identified as Deputy, 3rd Deputy, 2nd Deputy, 1st Deputy, Undersheriff, and Sheriff. Sheriff Patrick Corbett takes office and becomes the county’s first Democratic sheriff. He reorganizes the Sheriff’s Office into a “Department” with three separate “Divisions” – Jail Division, Civil Division, and Criminal Division. The Public Safety Building (P.S.B.) jail opens. The City of Syracuse Police Department and City Fire Department join quarters with the Sheriff’s Office at the P.S.B. in an effort to consolidate services. Hat badges were discontinued when the Sheriff’s Office adopted a new uniform style. Sheriff Corbett proposes the 911 telephone emergency communication system, but the plan is rejected. The “Matron” position is abolished. Women deputies now held the title of “Deputy”, the same as with their male counterparts. A study recommends immediate repairs/eventual complete replacement of the Jamesville Penitentiary. The site is plagued with a number of escapes from work details. There is a disturbance at the Jamesville Penitentiary and Sheriff Corbett mobilizes the Department’s Occurrence Control Unit to put down the disturbance. A joint Syracuse City Police Department and County Sheriff Department helicopter patrol is formed (Air-Stop). The Onondaga Law Enforcement Mobil Radio District (O.L.E.M.R.D. ), a countywide police communication system, is established. The Sheriff’s Department relocates to a new headquarters at 407 South State Street. Sheriff Corbett proposes to take over the operation of the Jamesville Penitentiary and, in 1983, it is replaced by an adjacent site. The Sheriff’s Department Criminal Division adopts the seven-point star shield and it would be adopted department-wide by 1982. The Sheriff’s Department establishes sub-stations around the county. In February, Deputy David Clark is fatally shot by inmate William “Billy” Blake during a failed escape attempt. Deputy Bernard Meleski is also seriously wounded. Deputy Clark is the first Onondaga County Sheriff’s deputy on record to be killed in the line of duty. A federal order places a 248 cap on inmate population in the P.S.B. The Jamesville Penitentiary modular facility is used for jail inmate overflow. This provided a temporary solution, but would lead to labor dispute issues. The overcrowding issue prompted studies for a new jail facility. Onondaga County appropriated $52,600,000 for the new Onondaga County Justice Center jail facility. The emergency 911 communications system is established. 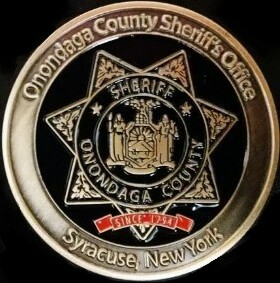 Onondaga County and Onondaga County Sheriff’s Department bicentennial. The Statewide Automated Fingerprint Identification System (S.A.F.I.S.) is adopted. A new union is formed to represent the department’s Police Division membership – Onondaga County Sheriff’s Police Association (O.C.S.P.A.). The Deputy Sheriff Benevolent Association (D.S.B.A.) continues to represent the Custody and Civil Divisions. Sheriff Kevin Walsh opens the new Onondaga County Justice Center jail, a 616-bed direct-supervision facility. Sheriff Walsh reinstitutes the title-name Onondaga County Sheriff’s Office. 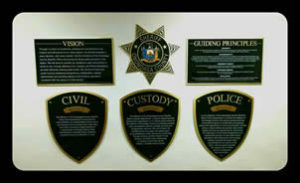 The Office is divided into three departments – Police Department, Custody Department, and Civil Department. Sheriff Walsh adopts the black uniform for both the Police and Custody Departments. The plan served economic interests and as a strategy to invoke the office’s fraternal order. 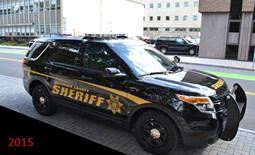 The Onondaga County Sheriff’s Office becomes the first Sheriff’s Office in New York State to receive accreditation in the areas of Police, Custody, Civil, and Crime Lab. A new crime lab facility opens in the City of Syracuse. The facility consolidated the Sheriff’s Crime Lab, the Syracuse P.D. Crime Lab, and the County’s Medical Examiner’s Office. The facility was named after the late Syracuse Police Officer Wallie Howard Jr., who was killed in 1989 during an undercover drug investigation. The Sheriff’s Office Aviation Unit retired its 18-year-old Bell Jet Ranger helicopter. Air-1 was replaced by a Bell 407 helicopter which provides a 50% larger payload, greater fuel capacity, an infrared system for searches and rescues, and a video downlink to provide live images to a new ground mobile unit. The Sheriff’s Office adopts a commemorative millennium era badge. The badge design was reminiscent of the officer’s badge design circa 1900 and remained in service for the years 2000 and 2001. Sgt. John D’Eredita developed the S.T.O.P.P.E.D. (Sheriffs Telling Our Parents and Promoting Educated Drivers) program, designed to monitor teen driving, and received sponsorship from the New York State Sheriff’s Association. The program sparked statewide and national attention. A 20-year retirement is secured for the Sheriff’s Office Police Department members. The issue of a 20-year retirement for Deputy Sheriffs employed in a police capacity had been a controversial one across the state since the mid-1970’s. Lt. Annette Bragg is the first woman to be appointed as a Deputy Sheriff Police Captain. The web site for the Onondaga County Sheriff’s Office is developed by one of its employees, Julie Durham, an Account Clerk in Personnel, and launched in the beginning of 2003. On November 29th, Deputy Glenn Searles was killed in the line of duty while assisting a stranded motorist. Deputy Searles pulled over to the side of I-481 behind the stranded motorist with his emergency lights flashing to help. While attempting to remove flares from the trunk of his police car, he was struck by a mini-van that slid across the snow and ice-covered road into his vehicle, pinning him between both vehicles and causing him to sustain multiple injuries leading to his subsequent death. Deputy Searles is the second Onondaga County Sheriff’s Deputy on record to be killed in the line of duty. June, Onondaga Community College initiated a “Phase 1 & 2” pre-employment Police Academy. The program is initially instructed by the O.C.S.O. Central New York Police Academy. By 2013 O.C.C. would assume full responsibility for the training program. Cazenovia College initiated a parallel program Sept. 2005. O.C.S.O. patrol vehicles were equipped with electronic scanner-ticketing-and accident report (TRACS) system equipment. February, the Sheriff’s Office initiated Special Patrol Officer positions for security at the Civic Center and the County Office building. The positions were filled by retired law enforcement, correctional, & probation officers who served as Peace Officers in that capacity. April, Operation Integrated Municipal Police Anti-Crime Team “IMPACT” was initiated by New York State to heighten police visibility and law enforcement service in high-risk-crime area of the City of Syracuse. The team comprised of members of the N.Y. State Police, Onondaga County Sheriff’s Office, and City of Syracuse Police Dept. In-car audio-video camera system was fully implemented for patrol vehicles. The Central New York Law Enforcement Analyses and Data Base System “CNYLEADS” Criminal Justice information management system was fully implemented improving efficiency with an electronic report / data system. Project Lifesaver – The Sheriff’s Office initiated this electronic tracking program as a public safety initiative to locate missing persons suffering from dementia-Alzheimer’s -type disorders. The following year, O.C.S.O. would assume the position as the NYS Coordinator for the program. June, The Town of Clay voted to abolish its Police Dept. 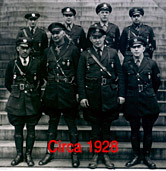 Plans were initiated to merge the Police Dept. with the Sheriff’s Office. The Sheriff’s Office implemented the merger of police service on July 6th. The Sheriff’s Office replaced its Armored “Peace Maker” vehicle with the Lenco “Bearcat” armored vehicle. Oct. 3, The K-9 Unit adopted a Bloodhound “Hero” member of the unit. The K-9 was donated by the Child Protection Education of America and the Jimmy Ryce Center. The unit comprised of eight K-9 partner teams. The Navigation Unit decommissioned its 1986 Sportscraft vessel. A 24 ft. Mackee Craft center console vessel and trailer is donated by the NYS Dept. of Parks and Recreation and Historic Preservation. In addition, two Sea Doo personal watercrafts were introduced into the fleet. March, The Sheriff’s Office acquired an aquatic Remote Operated Vehicle “R.O.V.” for underwater search and recovery details. The submersible was operated by lap top computer via a 500 ft. fiberoptic tether, allowing for remote underwater camera viewing and multi-frequency scanning sonar capabilities. August, The combined City of Syracuse Police and Sheriff’s Office Abused Persons Unit was relocated to the McMahann Ryan Child Advocacy Center. The move provided a multidisciplinary co-located partnering agency approach towards addressing abused persons related investigations, education, treatment, and outreach services. The Civil Dept. Field Operations vehicles were outfitted with mobile data terminals. Custody Dept. members were outfitted with stab/slash protective vests for protection against edged weapon attacks. The Hazardous Devise Disposal Team acquired a dedicated response “bomb truck” vehicle through grant funding. The Sheriff’s Office initiated an Opioid Overdose Prevention Program to equip and train members to administer intranasal naloxone dosage to persons at risk of experiencing an opioid-related overdose. Sheriff Kevin E. Walsh’s and Undersheriff Warren R. Darby’s last year in office. Sheriff Walsh and Undersheriff Darby served their first term in office in 1995. Their 20-year tenure was the longest term served for a Sheriff and Undersheriff in the history of the Sheriff’s Office. Sheriff Eugene J. Conway takes office and becomes the county’s 61st Sheriff to serve Onondaga County. The Office adopted a Code of Ethics, Vision, and Guiding Principles to direct our members to why we exist, the manner of which we make decisions, and the expectations of being a part of this organization. The Office also reviewed and renewed agency Organizational Strategic Goals and the Missions for each Department that better reflect our purpose and focus of resources. The Police Department instituted a new crime control model to ensure effective delivery of resources in a targeted manner based on need. These meetings occur twice a month where Command Level Personnel discuss current crime trends, patterns, and strategies to ensure public safety. The Office focused personnel efforts by identifying mission critical positions and transferring staff to these areas in order to increase effectiveness and efficiency of operations. At the beginning of 2015, the Office was predicted to finish the year more than $1 million over budget based on past experience and current operations. Through the focus and determination of the many members of the organization, the Office was able to finish Y2015 $500,000 under budget. The Office began building the infrastructure to review and update all current policy and procedure in pursuit of excellence through best practice. Currently the Office maintains New York State Sheriff’s Association Accreditation for the Civil, Custody and Police Departments. In 2016 the Office will be pursuing additional certifications to ensure transparency and create confidence in operations. The National Commission on Correctional Health Care conducted an assessment of the Justice Center and the Office was successful in attaining their accreditation certification. Caring for inmates that exhibit signs of mental health crisis continues to be a challenge for our Custody Department. Through ongoing analysis and planning, to include guidance from the National Commission on Correctional Health Care, the Office began a multi-faceted approach that couples procedural changes and modification to the physical plant. The “Safe Cell” project which is currently underway features modifications to 17 separate holding cells to further reduce the risk of an inmate in mental health crisis from seriously hurting him/herself. The specialized cells coupled with medical/mental health evaluation and subsequent frequent checks of the inmate by professional staff allows for a humane environment, while reducing the need for a constant watch by a dedicated Deputy. Sheriff Conway instituted a Deputy of the Month award and commissioned a special challenge coin for those members selected for their significant contribution to the organization and the Mission of the Sheriff’s Office. A new Volunteer Chaplain Program was developed to assist the members of the agency and the community. 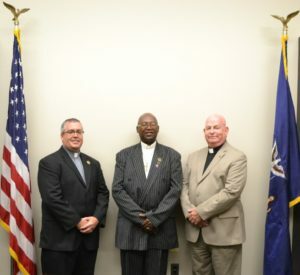 Three Chaplains were selected: Reverend Roosevelt Baums, Reverend Joshua Czyz, and Reverend Michael Grinnals. The Reverends have participated in a number of Office and Community ceremonies, tended to the needs of our members in difficult and challenging times, and assisted in the overall mission during sensitive and difficult cases where a member of the clergy was requested by Office members or the public. Additionally, the Office began the process of examining additional support programs for all staff due to the stressful and challenging nature of public safety. The Peer to Peer Support Program was formed to assist members and their family, in identifying issues that may be affecting their quality of life, and / or job performance and refer them to the proper support services as needed through trained members who work within the Office in other missions. The Onondaga County Sheriff’s Office held a Custody Academy and a Police Academy which included training members from several other law enforcement agencies around New York State. Due to retirements and resignations, the Office filled a number of vacancies in both the Custody and Police Departments. Presented with an aging fleet, the administration formulated a three year plan designed to minimize the maintenance and repair costs while ensuring safe, reliable vehicles for members in all three Departments. The first year plan called for the largest number of vehicles which was accomplished through creative purchasing and savings from other budget lines. The Ford Explorer was selected to become the primary patrol vehicle along with new / fewer graphics which reduced cost while increasing visibility. The Office renewed its commitment to providing timely and accurate information through the use of social media for direct connection with the members of the Onondaga County community. A redesigned and updated website was released that provides quick access and additional information to the user. The website will continue to be updated throughout 2016 to include the ability to view it on mobile devices. More frequent posting occurred on Facebook throughout the year and the Office began to use Twitter for the timely release of information.